Crazy Days at the Library! 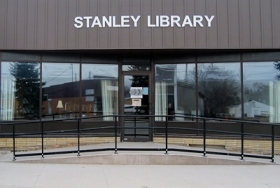 Crazy Days at the Stanley Public Library will be Friday, August 3 from 9 AM to 5 PM. Come and check out the great deals on books, movies, book bags and souvenir playing cards! Each child that visits the library that day will receive a free toothbrush and tube of toothpaste, courtesy of Delta Dental of Minnesota and their Inspiring Smile Power Initiative along with National Smile Month.